I got hold of some fisheye lenses for my mobile phone so I could photograph people looking weird and decided to review them. Choosing the right selection of lenses was easy enough, price, combination lenses and fair quality – I wasn’t looking for anything special, it’s not like i’m David Bailey or anything! These Victsing fisheye and wide angle lenses also come pre-fitted with a Macro lens – something I hadn’t expected so was a nice surprise (note to self – I really ought to start reading the product descriptions with more focus!) I like macro photography, so getting hold of a lens which would fit my mobile was a real bonus, no more need to carry round a huge cumbersome SLR digital camera now. So here is the kit I bought. It really is a smart looking bit of gear, the lenses are slim enough to be fit into a tidy carrycase which acts to protect them and keep the lens coatings free from dirt whilst in storage, but they also come with lens covers aswell for added protection against bangs and knocks. They are threaded and screw tightly into the clip which grips firmly onto the outer casing of your mobile smartphone. Note I say firmly – they are a great quality and once attached they don’t wobble or come off. Aligning them is easy too – you can look through the lens to make sure that the camera actual glass is centered on the fitted lens, or you can simply observe through the liveview on your screen as you move the clip around until it is in position, in strong focus and with no edges showing. The photograph above gives you a clear indication for reference of the size of the equipment in comparison to a samsung mobile running andriod – although it should be noted that the operating system is independant of the kit – it makes no difference what you have. Lets take a look at one of the lenses actually fitted onto my mobile phone. 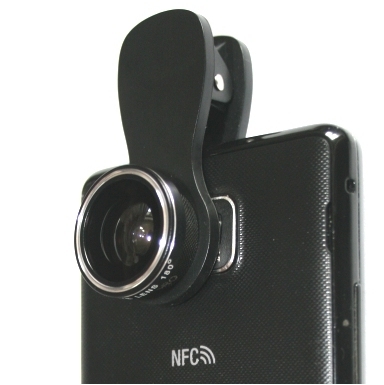 Above is the 180 degree fisheye lens fitted to the phone and ready to take photos. Beware with such a large angle that you get your fingers out of the way before activating the camera shutter, you don’t want photo’s spoiled with your fingers in the way and the lens is so wide that you really have to hide your digitals! 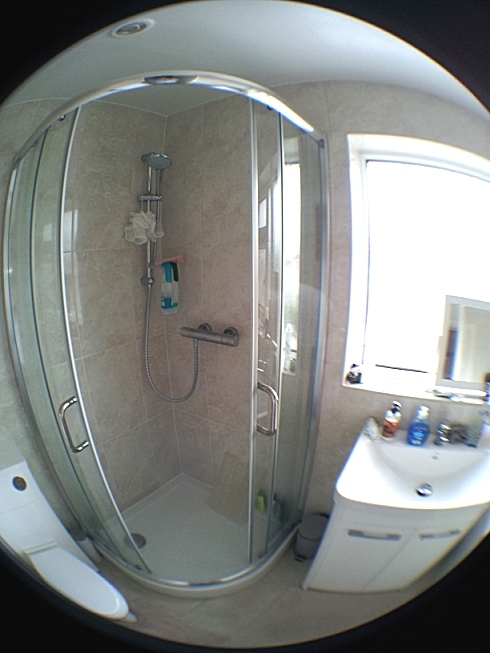 The kit has three lenses as I mentioned, the first looked at is the example with the fisheye – below is an image taken indoors of my bathroom showing the bend created by the lens when in position. You will note the black circle around the captured area which adds good photographic effects in my view. Now when looking at the photo, bear in mind that my camera is a samsung galaxy s2 – yours is more likely to be a newer version and as such will naturally take sharper, higher resolution images. The effect will be the same though. Next up I photographed a couple of items with the Macro lens attached. I was really surprised at the sheer zoom power of this particular lens. It is so powerful infact that it acts like an underpowered microscope more than a camera. I wanted to purvey how sharp the focus was whilst at the same time display the power of the zoom. No need to worry about focal length here, or any other technical photography terms such as ambient light conditions, field of view or depth of field – simply attach the macro and then point and shoot. 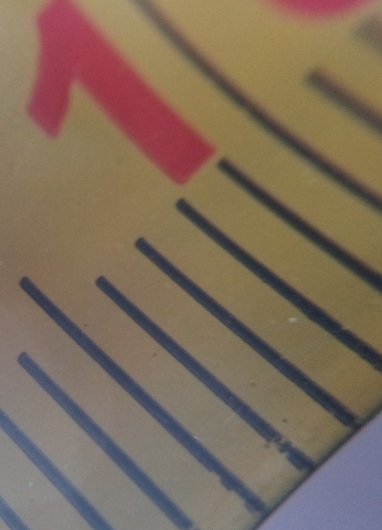 See below for the photograph taken of a tape measure (MM measurements! 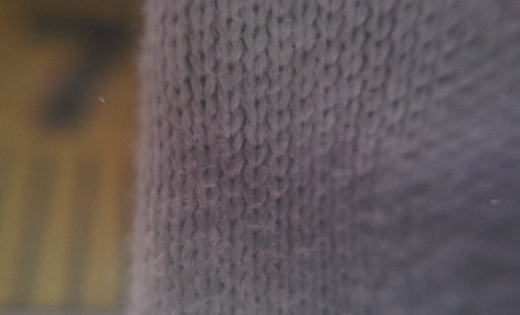 ), followed by the actual threads close-up in a knitted weave – hows that for magnification on a low cost mobile? 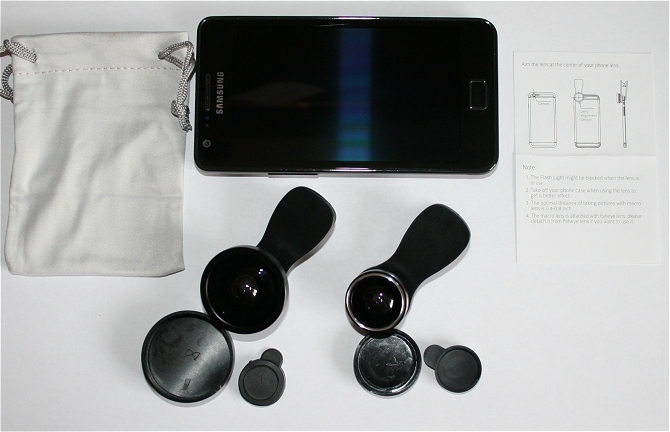 Finally, there is also a wide angle lens in the selection which comes with the package. This is ideal for taking photographs of landscape rather than portraits, such has rolling hills or mountains. I will be taking this up Kinder Scout to do some photography on the next bright day. All up this fisheye + wide angle + Macro lens kit is top quality and I am looking forward to gettings some funny pictures with it at gatherings without the need to adjust the final photos with photoshop or paint shop pro. Whether you are an amateur photographer or just a normal mobile phone user looking to capture those special moments with a difference, then these could be ideal for you! VicTsing Fisheye Lens for Mobile Phones. BBC Micro:Bit For Kids Learning Programming.